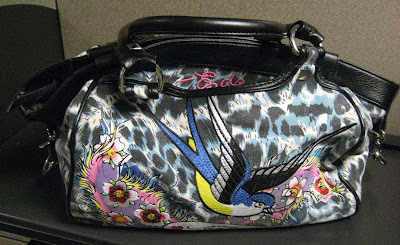 It's been a busy week and I'm just now coming up for air to share with you the cool items I found this past weekend. It was a cool and very windy weekend and I felt like I was living in Chicago...still, even whipping winds would not deter me from a good treasure hunt and it was a great little hunt. I found some marvelous antiques that I don't usually find in the Atlanta area. Maybe the whipping Chicago winds channeled Midwestern antiques to come look for me and found me they did. 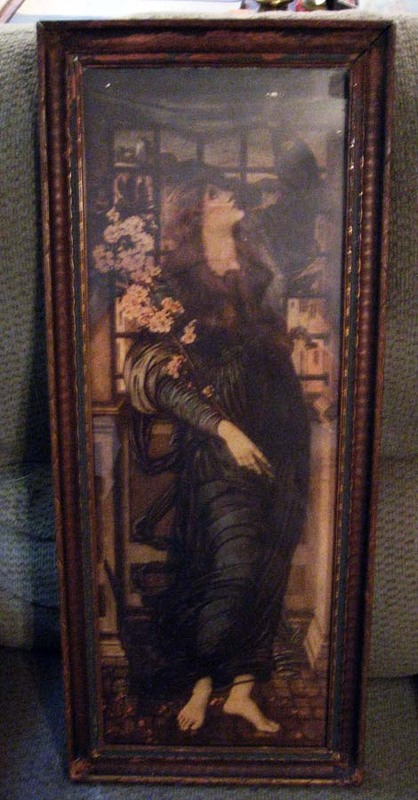 Nearly a yard long, this amazing "Romantics" print under bubble glass with original frame is perfect in every way. Colors are true and brilliant. Wish I had gotten a better photo but the light kept bouncing off the glass. 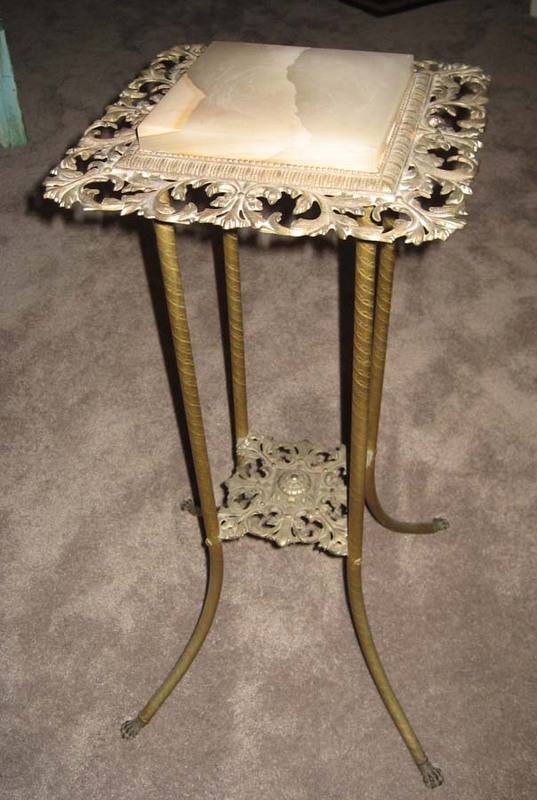 Heavy cast bronze and brass legs with thick, onyx inset Victorian plant stand is a winner. Found in every little "Catholic" girls bedroom, these vintage "nun dolls" are sweet. 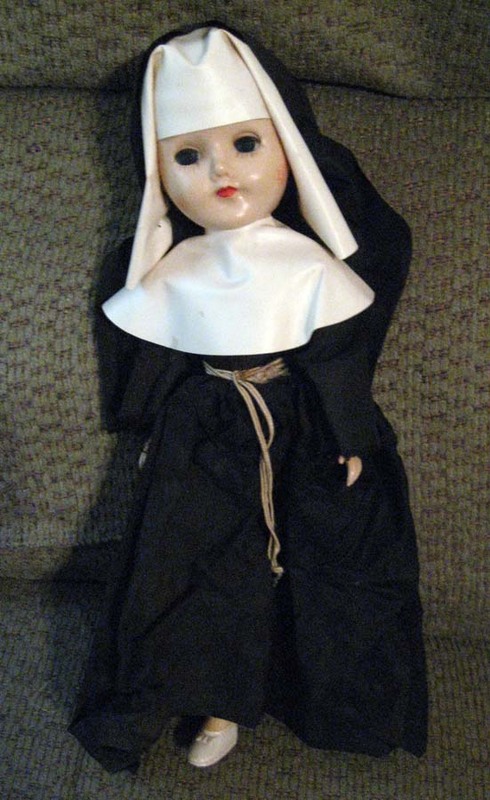 Growing up in New Jersey, my girl friends and I all had one. Oh yea, how cool is this motion lamp from the 1940-50s? 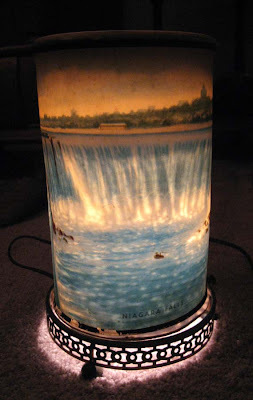 The classic souvenir from Niagara Falls, this baby is complete and works beautifully. When you can find them they are usually missing parts and the shade is often melted. This one is in very good condition and I scored with this lamp and only had to hand over $5.00 for it. 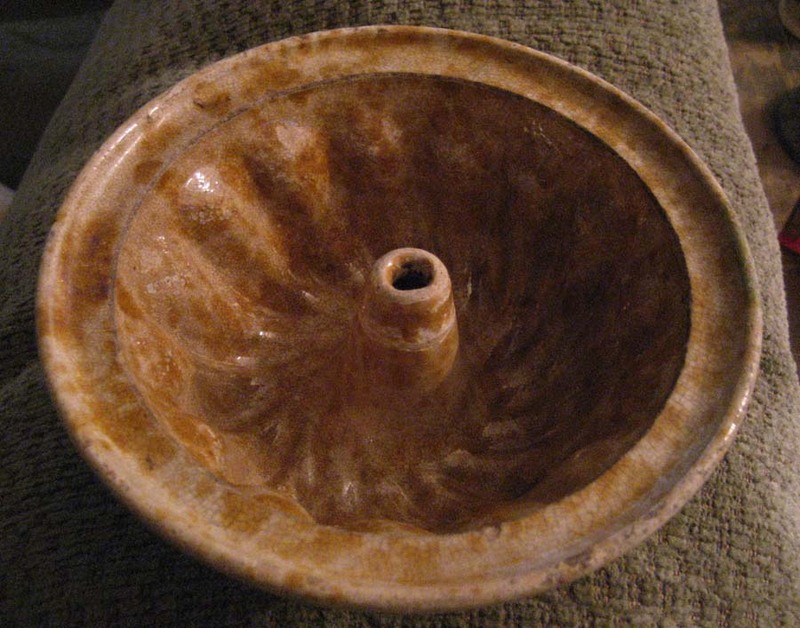 I always find it amusing when I come across the same antique piece that I have found previously. 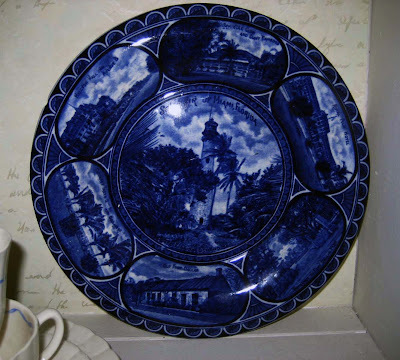 I found this same lovely little Victorian Commemorative Centennial dresser tray almost a year ago and sold it to a reader who saw it on my blog. Let's see if that happens again from another reader. 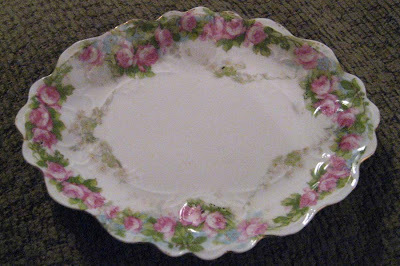 I should have placed a ring or some change in this pretty little "pin" dish as at first glance it looks like a huge serving platter. 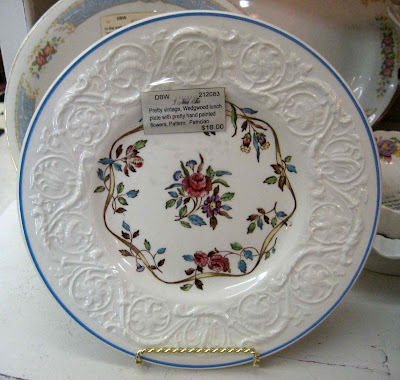 Late Victorian with hand painted and transfer ware roses around it. 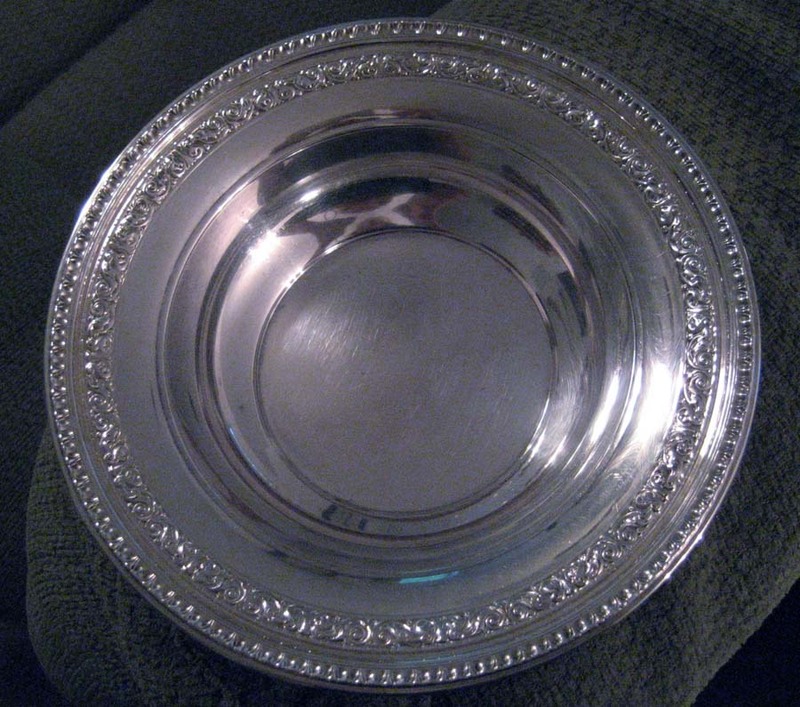 Lovely, Reed and Barton silverplated bowl and in a large serving size. 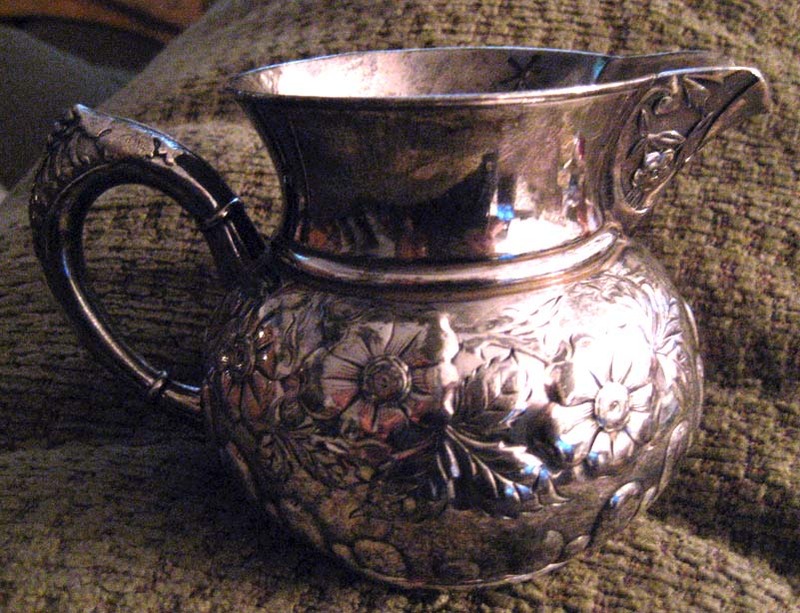 I move silver and silverplate very well so when I find good pieces like this I grab them. Old or contemporary, everyone seems to like silver serving pieces. 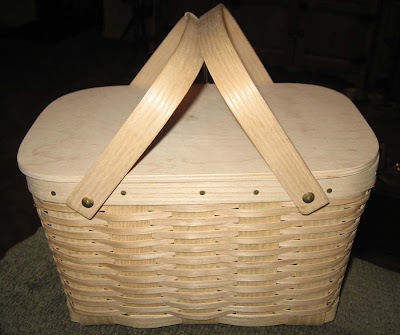 Beautifully made, Basketville basket. A contemporary piece from a Made in the USA company, it's not old but it is pretty just the same. 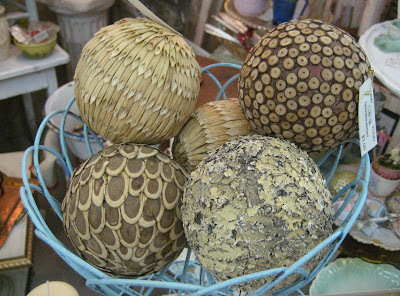 I have a fondness for American basketry and have a few antique "market" baskets in my home. 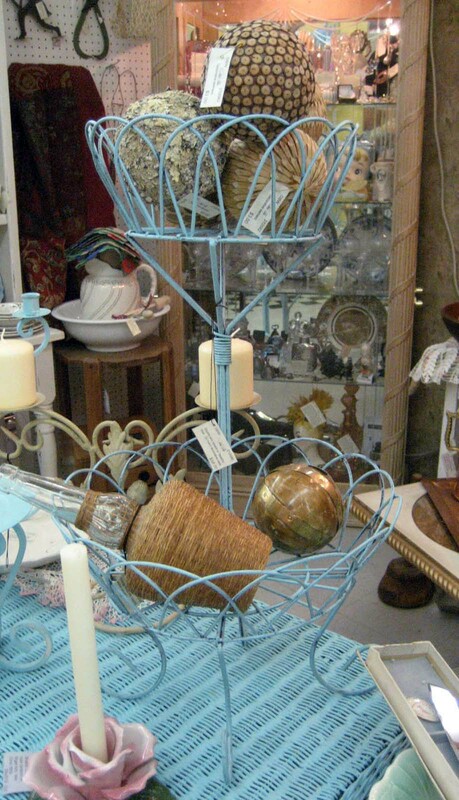 Well made, contemporary baskets continue to rise in value each year. 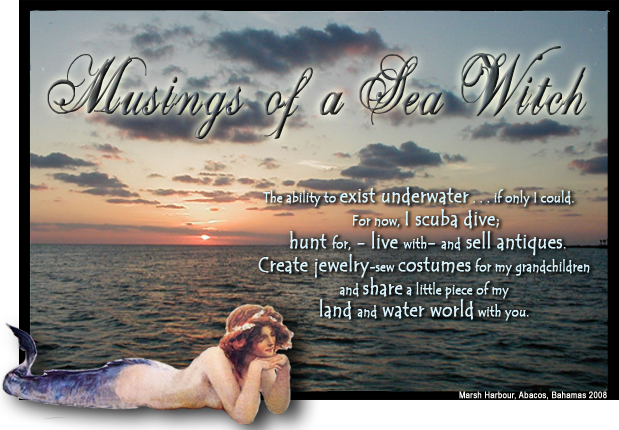 Ahh, and one for the seawitch. 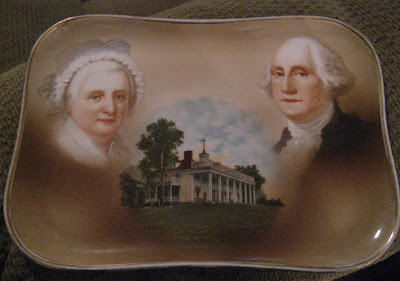 I adore antique yellowware and pudding molds so I hit gold with this find. Nice, fluted pudding mold is a smaller size (about 7 inches in diameter). Believe it or not, I found this at my local Goodwill for $1.81. 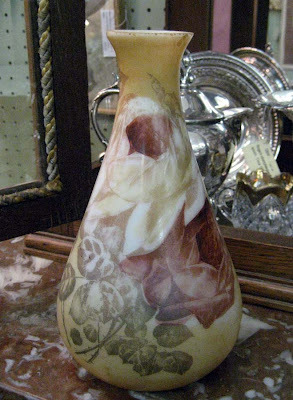 Love the glaze on it and it now resides with my other molds. 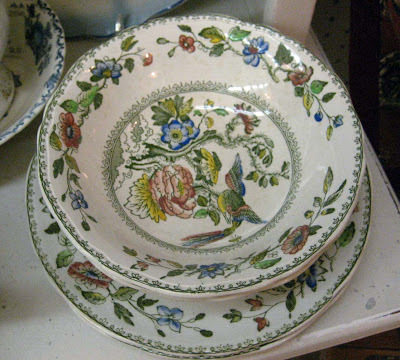 One Christmas I am going to make traditional puddings in them and serve them up like a Thomas Nast Christmas feast. 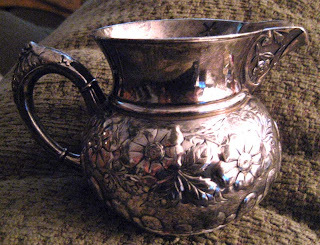 Pretty little quad plated creamer with heavy embossed flowers at the base. Lots of silver still remains and I may hang on to this for a while. It seems very happy on my buffet at the moment. Where have you gone? Are you tired of the blog world or have you moved on to Facebook and Pinterest? I miss your posts and your photos and your point of view. Still, I understand that interests come and go. For those of you who are still around and visiting, I'm delighted you have stopped by. It was a lovely weekend with April southern weather...warm mornings, a little afternoon heat that is perfect for a vitamin D on the face and then cooler nights. 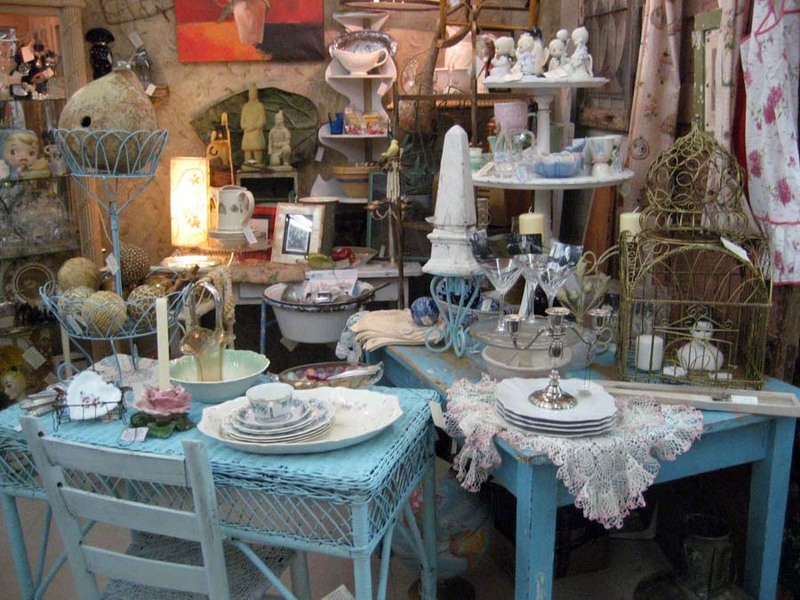 Spent Saturday junkin at my favorite haunts and can I say, "I scored?" Yea, the sea witch did. 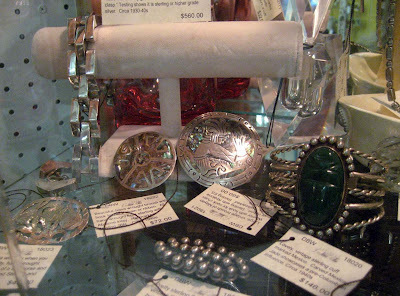 Found some wonderful things and a few surprises...items that I rarely see unless I am in the Midwest. So let's look at a few photos, shall we? A major find. Victorian mantle, 8-day clocks are not often found in the Atlanta area and when they are they need lots of work. 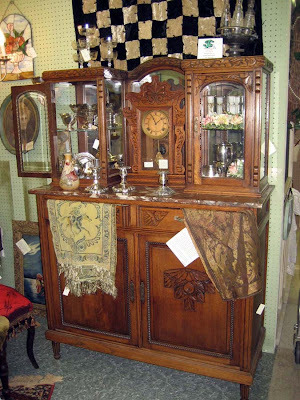 This pressed oak beauty is in nearly mint condition needing only a thorough cleaning. 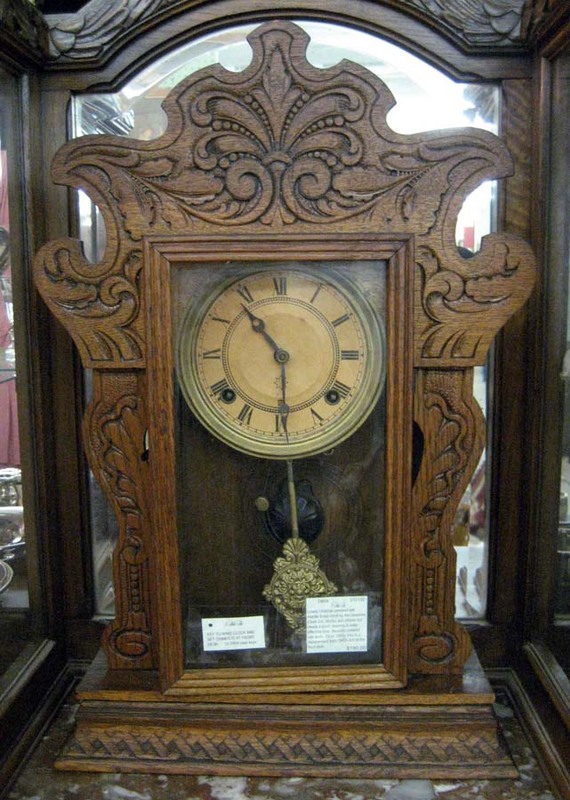 Original everything but the key to wind the clock and set the chimes but that is not an issue for collectors. A little bit of oil worked into the lovely oak and I wound it up and she sang so sweetly and kept good time. These mantle clocks must be "level perfect" to keep running and tend to run about 10 minutes fast but this one was keeping solid time. The chimes are a bit clangy and the gears are very loud when the chimes kick in but the good cleaning will eliminate that. I placed it on the Victorian sideboard and it looks marvelous on it. Gives you a good visual about how big it really is. 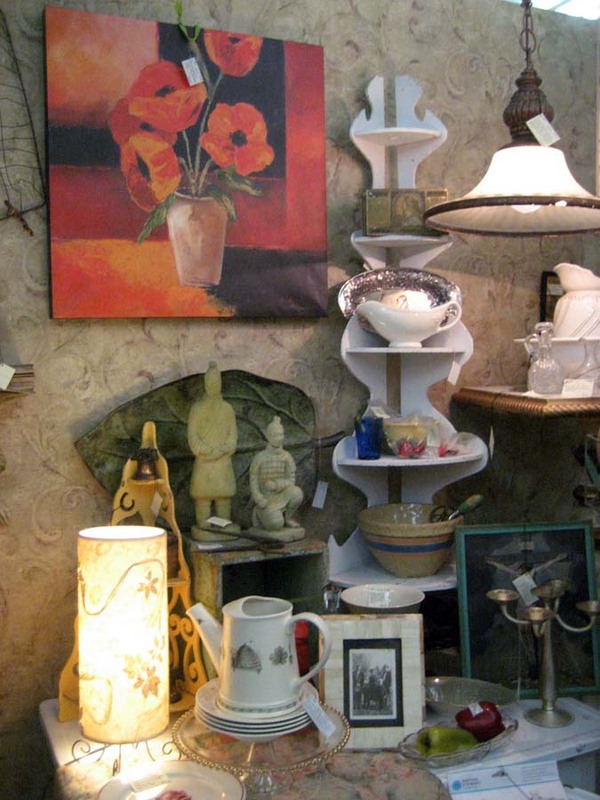 Candlesticks of all types are flying out of my booth. I sold 8 different sets this past week and was hoping to find more as all had sold from by booths. I was lucky to find more. 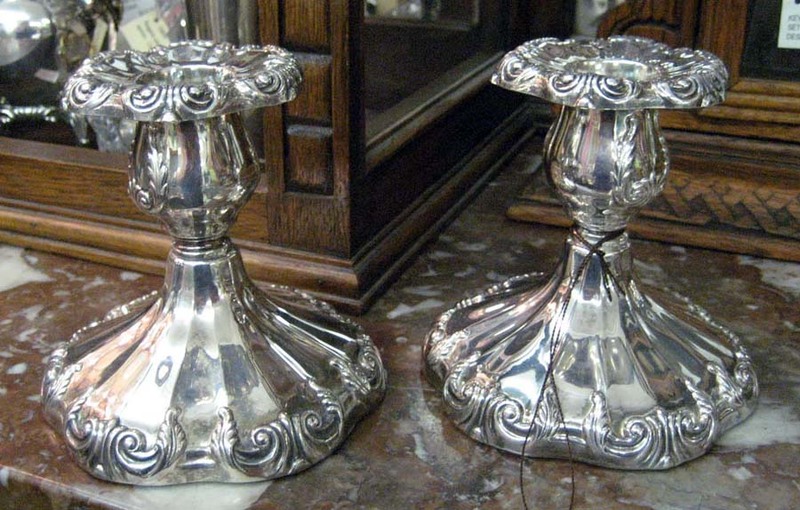 This is a lovely pair of Reed and Barton heavy, silver plate. Gorgeous. 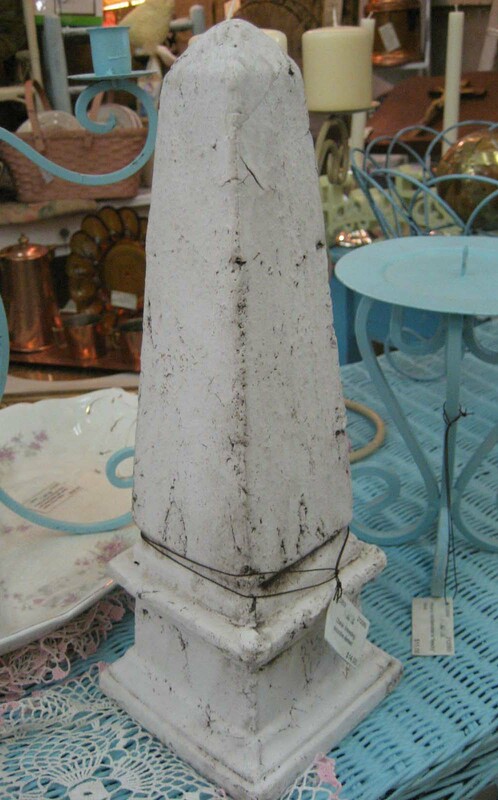 This pretty single candlestick from the 1920s was filthy and black but for $4.00, I couldn't walk away from it. So glad that I took it because it cleaned up beautifully. This photo does not do the candlestick justice. Very heavy with lovely filigree work. A weighted Sterling dual cup candelabra. I sell sterling as quick as I can find it, even with repairs, it seems to move. Also found a three cup candelabra at the same haunt. 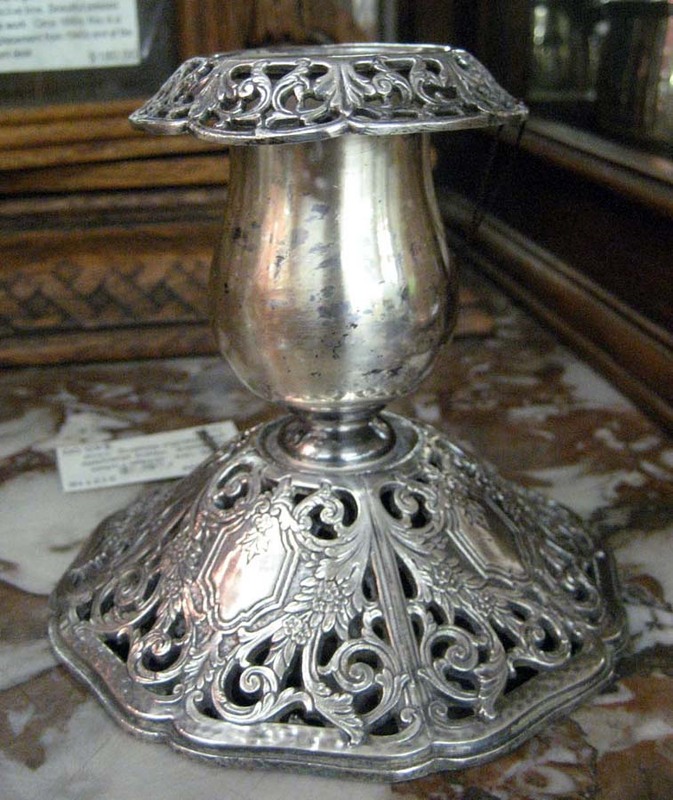 Not a sterling piece but a nice, quality silverplate. 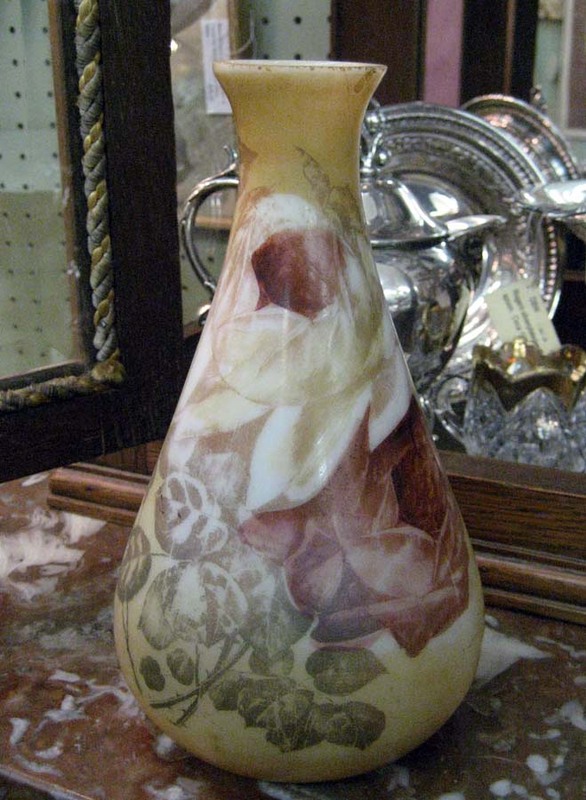 A pretty milk glass vase with cabbage roses on it. Love the shape. Huge Victorian tapestry runner in soft shades of celery and green. This baby is over 4 feet in length. 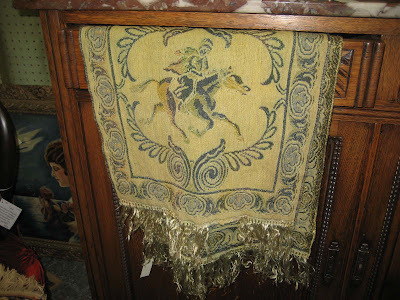 Sweet little Persian rug is not old but they move so well in this area that I had to grab it for $2.00. 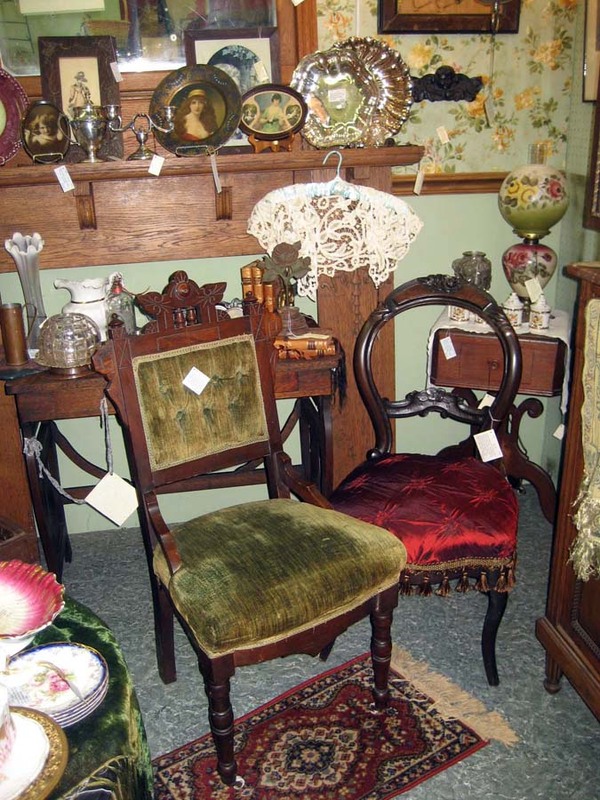 It looks nice with the two Victorian chairs. Another find that took me by surprise. 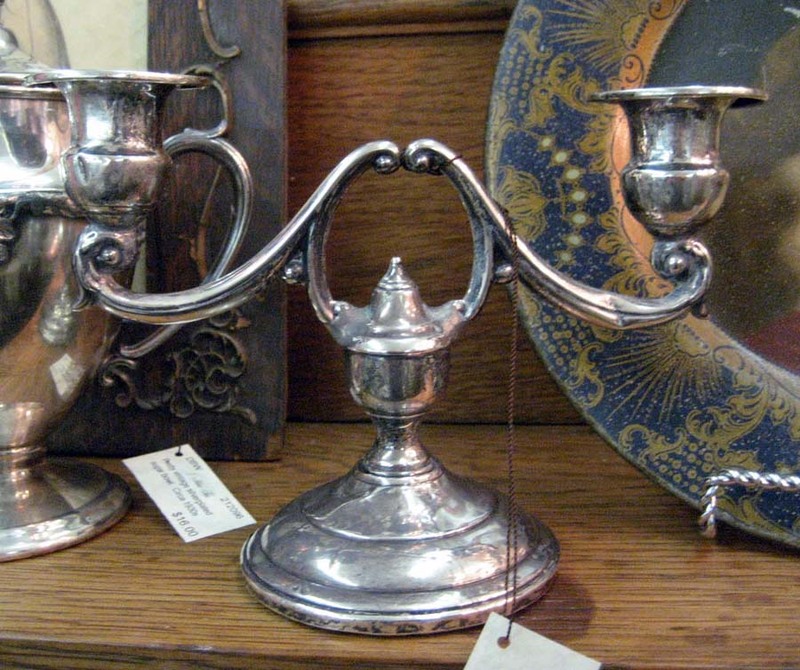 I saw this early 1900s candelabra pair of what I thought was silver plate. They were black with patina and when I picked them up I knew they were sterling. They polished up so lovely and that is when I discovered the three silver hallmarks. Following a little research I found that these are worth quite a bit of money so into my locked case they went. I can't wait to see who purchases them. Yea, that is an Apple Juice Bakelite chunky bracelet. First piece of Bakelite I have found other than pieces that are offered up in antique shows since moving to Atlanta in 2000. A lovely piece and prices of Bakelite have really skyrocketed over the last few years. So if you can find it, grab it if it is affordable. 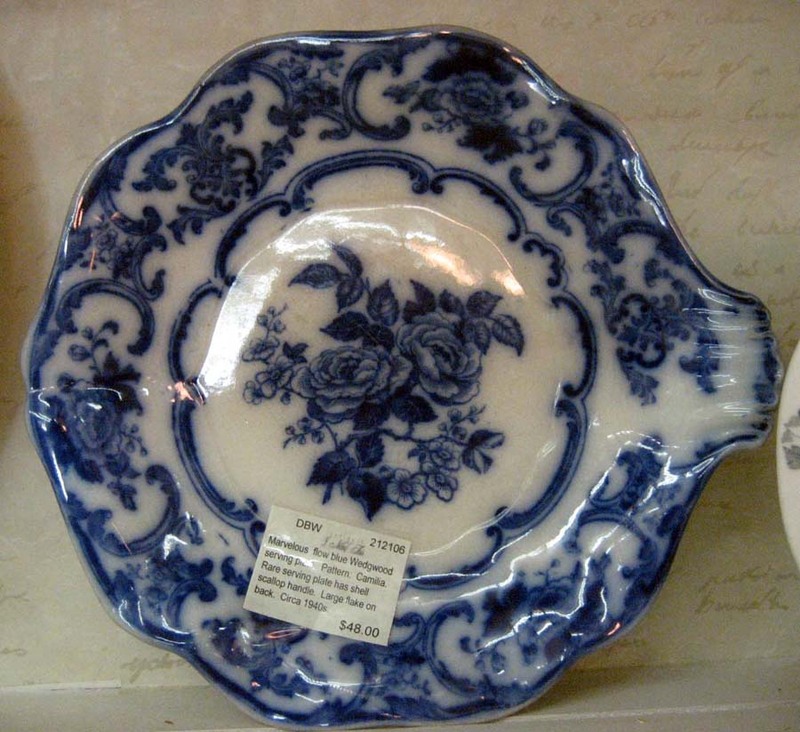 Pretty flow blue Wedgwood, serving plate I love the little handle on the side. Are you a Mad Men fan? 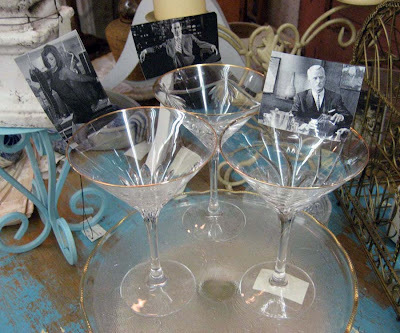 If so than these vintage martini/cosmopolitan glasses are for you. Quality crystal with that lovely ring and each has different cut patterns on them. Added Don, his wife and Sterling photos to them just for fun. Four pretty Homer Laughlin bread and butter plates and seven Crookville bread and butter plates. 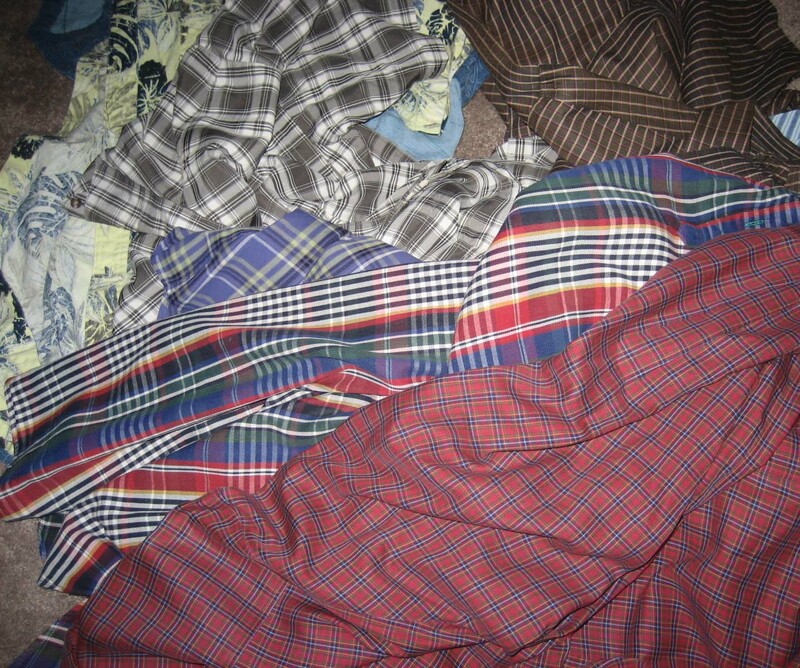 At a quarter a piece, I bought them all. I love finding deals like these because I can pass them on to my customers. 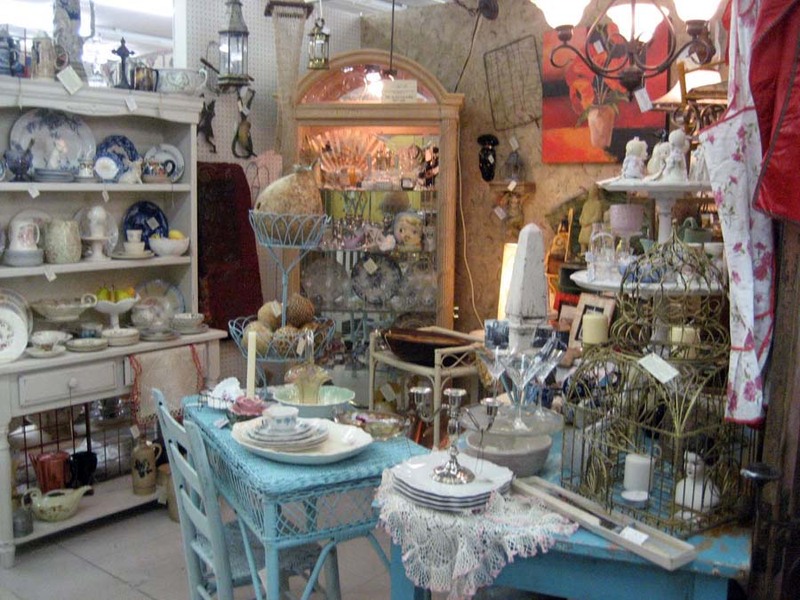 Half the fun of antiquing, as a collector, is the hunt and a great price. 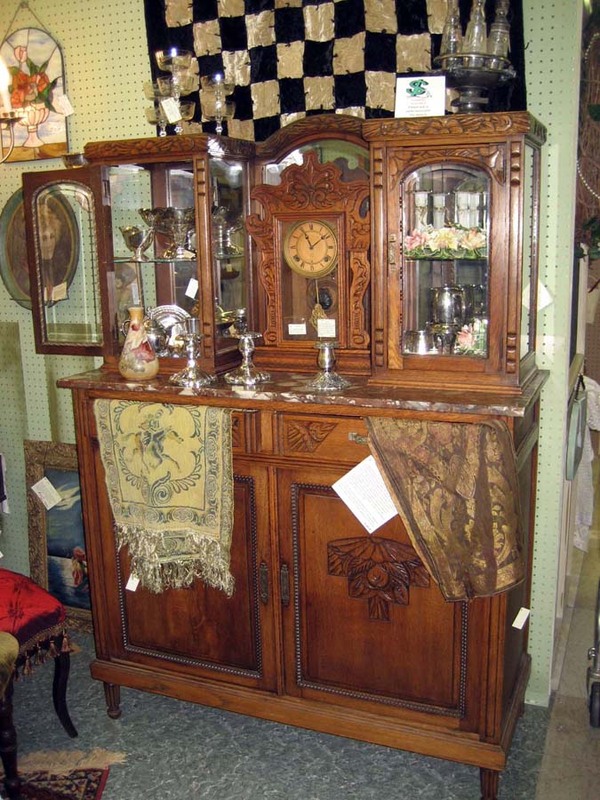 Homer Laughlin and Crookville collectors will get these at a screaming price, courtesy of I Need This, Antiques. I adore cobalt blue on white china and these pretty and heavy ceramic balls are lovely design elements. I did a booth redo in my main booth and liked the way this turned out. The minute I rotate stock, the pieces seem to jump out at customers. 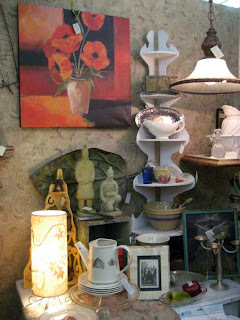 I was selling pieces as I placed them on this shelf and had to replace items several times while working the booth. Surprised that the pretty poppy painting has not sold yet...but then again, each piece sells in its own time. I'm one of those funny dealers who likes to rotate whats in my booth after a while. If I don't move things around I feel the booth stagnates. This setup really shows off the beachy blue items and it's easy to navigate around and in the booth. I took the vintage ladderback chair down from the 40s kitchen table it was sitting on and paired it with the Victorian wicker desk. I really the marriage of the soft blues. It has such a sweet cottage feel to it. 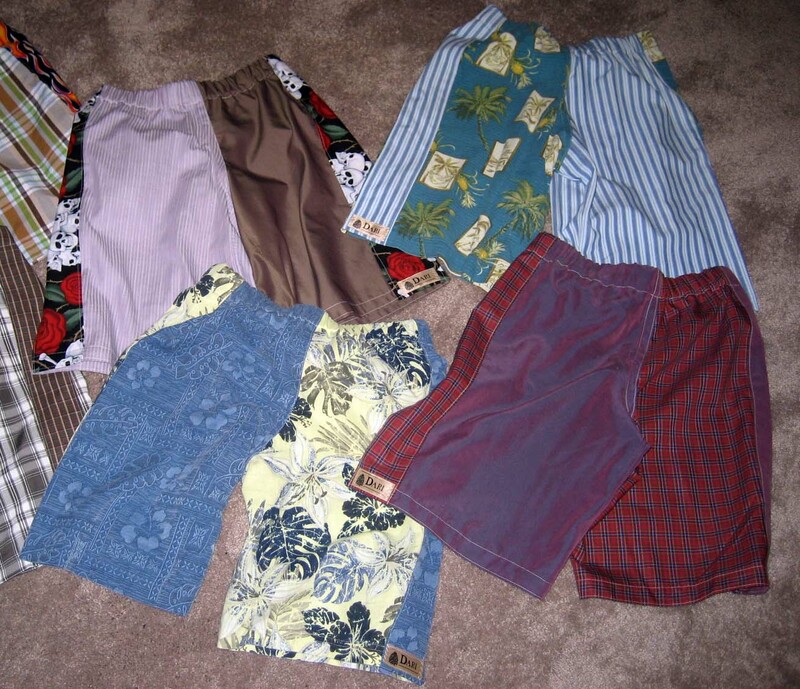 lacrosse shorts. My Aurora, Colorado grandsons (twins) play lacrosse and they are good. So good, they literally run through their shorts every few weeks. 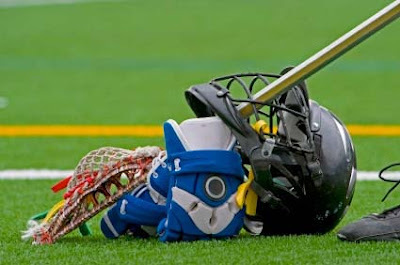 The costs of keeping them in lacrosse shorts is expensive since they average around $60.00 a pair. 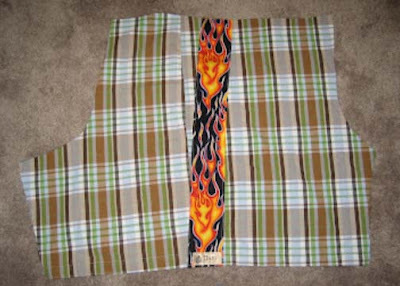 My son asked if I would sew up a few pairs for them to practice in but I had to use a blended fabric. 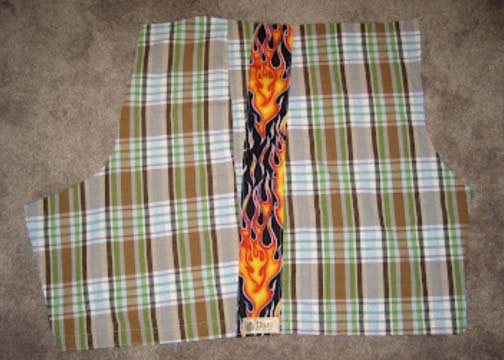 100% cotton would NOT do as it does not hold up under the wear and tear of what these boys put their lacrosse clothing though. No problem, I'll just pick up some cotton blends at the fabric store and all will be good, right? HOW ABOUT WRONG!!! 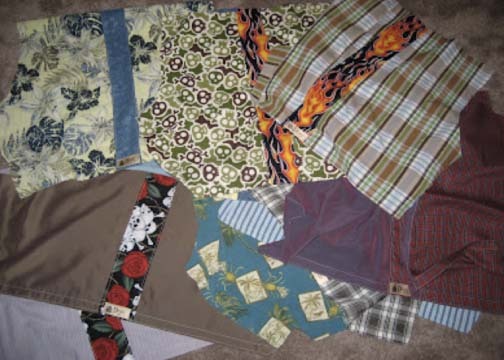 Blends were nowhere to be found as 100% cotton has taken over with quilters leading the charge. I couldn't find them on line either. What was this seawitch going to do? Side bars are a must with lacrosse shorts. Such fun putting these crazy patterns together. I was able to put together eight pairs of lacrosse shorts for my grandsons and I love the way they turned out. The fabrics will breathe like cotton but have the durability that comes with a blend. 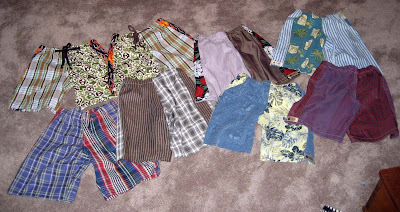 The fun was playing with the patterns and going a little "green" by repurposing shirts into shorts. Lovely weekend that has come to its too short conclusion. We have entered summer temps...80s and lovely that makes you want to just keep playing. 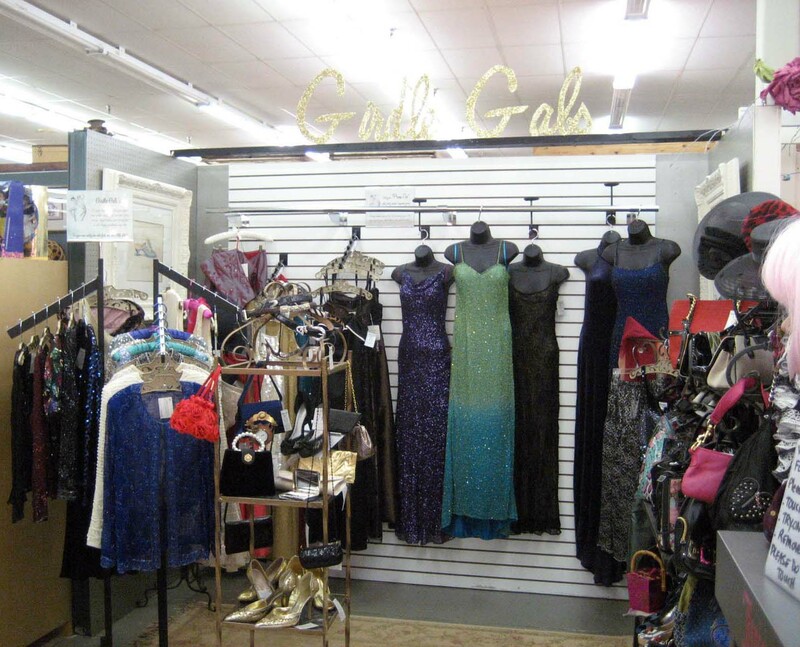 Got a little painting in and finally created the sign for my clothing and accessories booth...Girdle Gals is now official. Hard to see in this photo because of the fluorescent overhead glare, but the gold glitter script looks wonderful if I do say so myself. 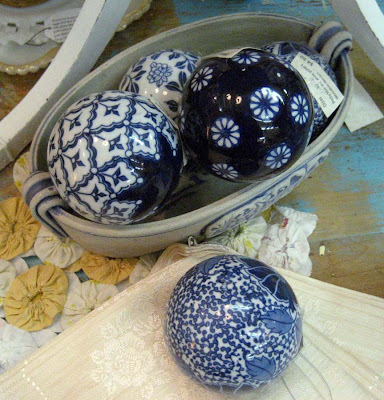 I've been painting items "beachy blue" this weekend. 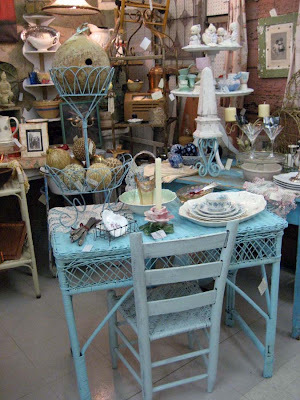 My favorite color in several shades transforms the every day into beach cottage chic. 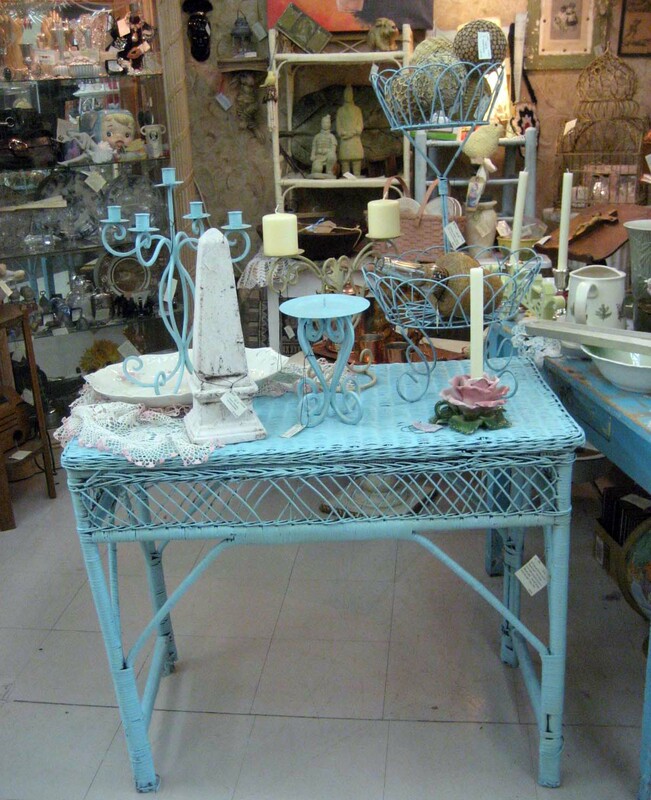 Nice vintage wicker table is filled with wrought iron candle cups and stands, a garden obelisk, and a large vintage platter. The large platter was found this weekend. 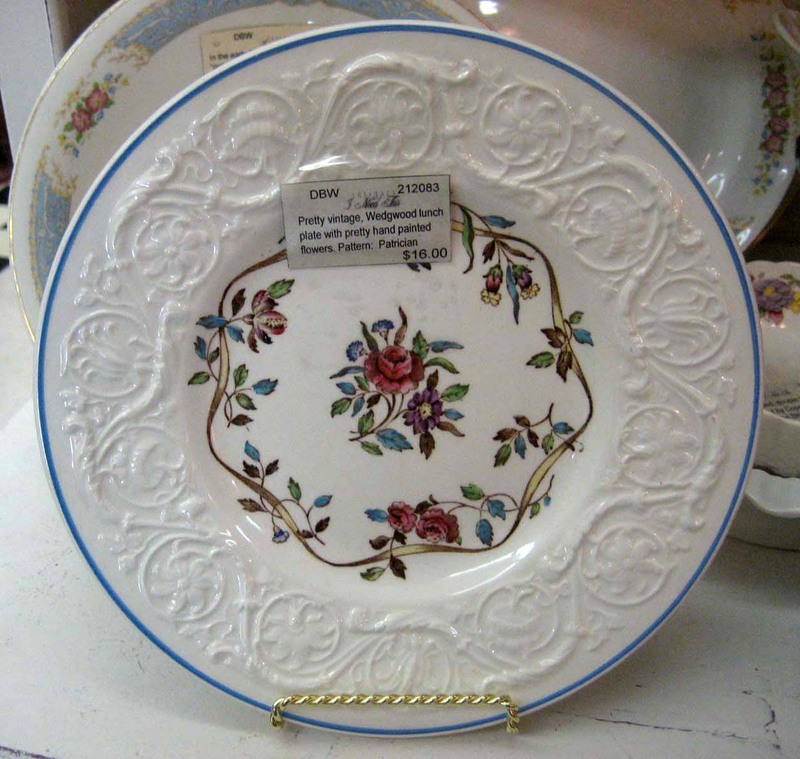 It is a Johnson's Bros. serving platter with pretty transferware violets and from the 1900s. 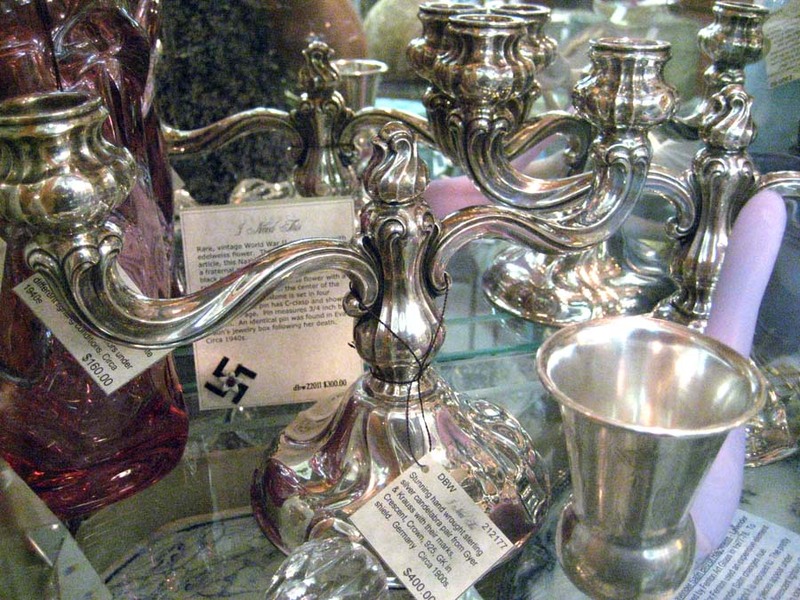 The five cup candelabra was found at my local Goodwill for $3.93. It was rust brown and I love the transformation with the beachy blue paint. 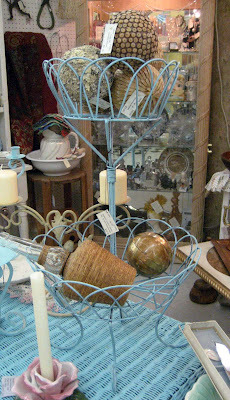 Another Goodwill find, this double tier, wire basket was priced at $5.85. With a paint redo from black to beachy blue, it has a new look. I really like this piece so if it doesn't sell, I won't be disappointed. AND another Goodwill find...these neat decorative elements decorated with straw, cork, and lichens. Light as a feather with marvelous textures. And now more treasure found this weekend...heavy decorative obelisk. 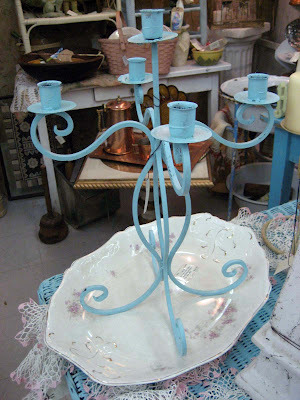 Perfect for a mantle, a table or patio. 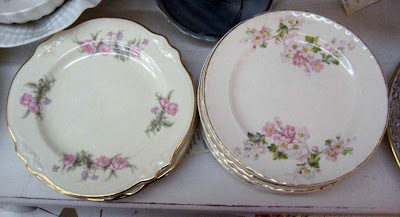 Lovely set of vintage transferware. Exceptional find at a favorite haunt, this extremely rare, rich, flow blue souvenir plate of Miami Florida is amazing. 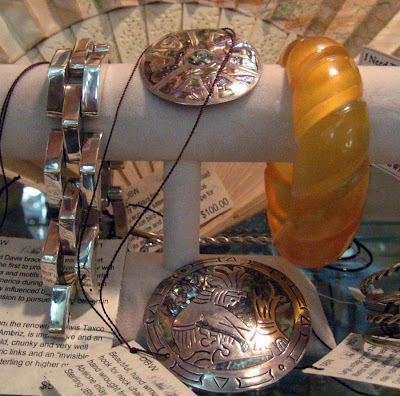 Have been digging out my vintage Taxco pieces to sell. Brought in a few, but have a lot more to price and bring in. My honey and I love the series, Downton Abbey set in the early 1900s. 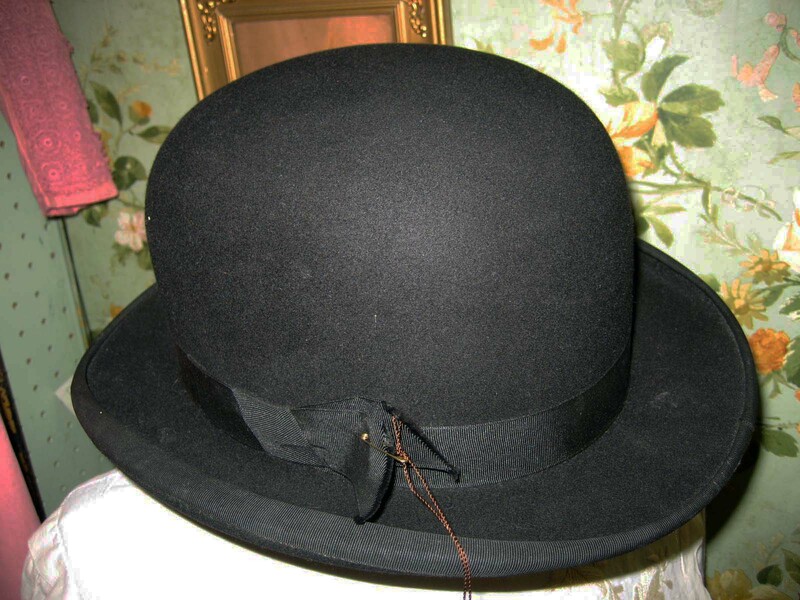 The men are often seen wearing a bowler and looking quite dapper. This bowler is in as pristine condition as a collector could want and straight from Dobbs, Saks 5th Avenue...the premier men's store for over 150 years. A man's hat needs just the place to hang it on when not wearing it. 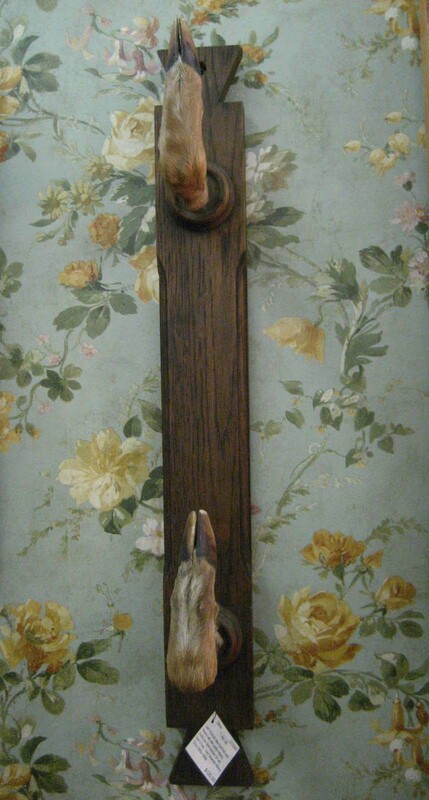 Marvelous heavy oak and deer hoof hat rack. 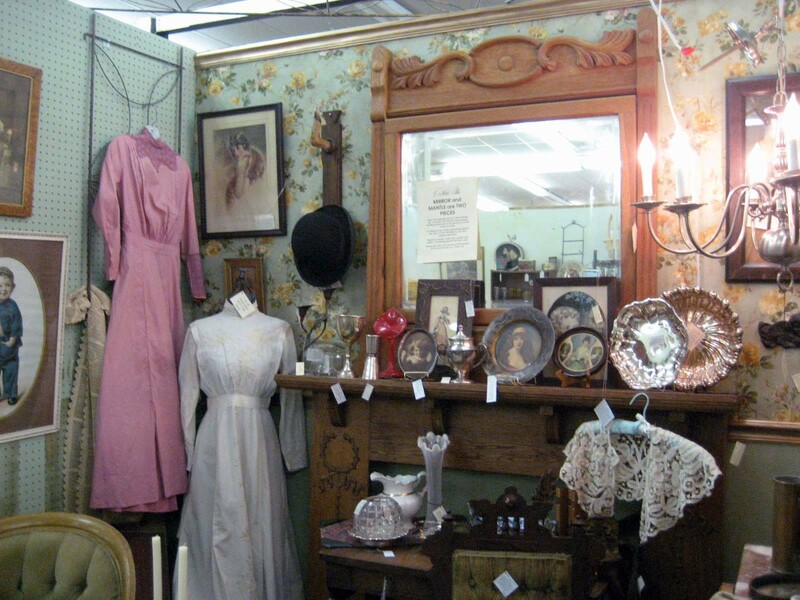 Very Edwardian...very Downton Abbey.